Use a paintbrush to apply the Gloss Heavy Gel. On one bottle I used the round end of a plastic spoon to make scallops, on another toothpicks for lines, and the third I used a scrubber pad to add the texture. Now you have to be patient and let it dry. Crystal Gloss Enamels have really pretty colors, but I wanted mine to be a bit more muted and beachy. So I mixed my three colors with white to tone them down a bit. Paint each bottle and allow them to dry. 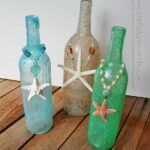 String various beads onto twine and hot-glue the “bead necklaces” to the bottles then glue the starfish in place. This project for Wine Bottle Craft: Textured Beach Vase was printed from CraftsbyAmanda.com - https://craftsbyamanda.com/wine-bottle-craft-textured-beach-vase/ and can only be printed for education or personal use.